As you know by now, I’m a huge fan of Andrew Zimmern’s Bizarre Foods (the reason I got cable in the first place). A while ago, he did an episode in NY and went to Jewel Bako. Ever since then, it’s been on my list of “must eat at places”, but as you know, living in NYC, this list is endless, and somehow, I just never got to it. Next thing you know, more than a year and change have past. Even so, I remembered it when Underground Dining and I met up for dinner a couple weeks ago. If anyone was gonna try all the things he had in the episode below with me, she would be the one. Pretty awesome stuff no? I couldn’t wait!!! 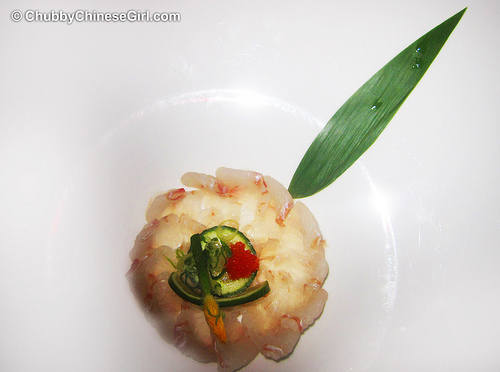 I wanted some of that lobster sashimi (which I’ve had in Boston and here in Sushi Samba, love love love), geoduck (so sweet, I’ve had it in other places) and those octupus cups with yuzu ( I was so “tasting” forward to them). … And I’ve never been so uncomfortable ordering. The really hot eye candy of a waiter we had, who definitely belonged in a Japanese soap, had no idea what I was saying. You see, the menu did not show ANY of the things Andrew had during his visit, sure this is like 2 years after the episode, but last time I checked the Tsukiji market is still around. So it went something like “Do you have lobster sashimi” “No we don’t serve raw lobster” “What? But Andrew Zimmern had it!” (I don’t think he knew who that was anyways). Next question “Hmmm, on TV I saw you beat the crap out of octopus suction cups with yuzu?, can we have that?”… again, he looks all confused. I’m totally embarrassed… to make me feel better, he goes back to ask the sushi chef and returns to inform us that everything I wanted was once served, or served only in season. 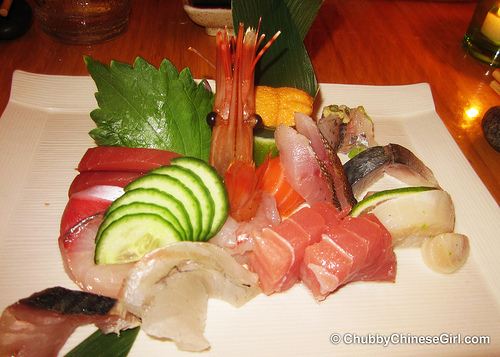 Oh wells, when life throws you ordinary ingredients, just order Chef’s Omakase. We started off with a yuzu fluke, I forgot if this was flown in. It was good, but no spectacular by any means. I had the Chef’s Omakase Sashimi. Really fresh. I liked the Giant Clam, Scallops that were marinated in yuzu, and the seared piece in the back, sorry forgot what it was. The best thing on this plate was the Sweet Shrimp with Head, the Chef actually took all that creamy and decadent orange roe from the head, and layered it between the delicately sliced in half flesh. So sweet and lucious. The texture and flavor was amazing. That bite alone was worth it!!! 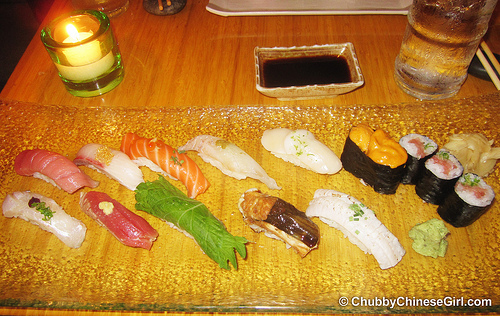 Underground Dining had the Chef’s Omakase Sushi. It had a lot of what I had, we made some substitutions, which they were very willing to do. She liked the bite that was wrapped with shiso leaf. Everything was delicately prepared and super fresh. Not the best sushi/sashimi meal either of us ever had, but I enjoyed it. Extra yummy rating for that sweet shrimp for sure! Maybe one day I will dine with Andrew Zimmern himself there, maybe then, the “exotic live” stuff would appear. Until then, as he says “If it looks good, eat it!” and I’ve taken that to heart. Good to know that the sweet shrimp redeemed the other missing items. It is disappointing that several items from the episode were not served. I went to Jewel Bako a while back because I watched the same episode! AND THE SAME THING HAPPENED TO ME! I ended up doing the sushi tasting and didn't really like it, but the sashimi tasting looks pretty good. Photos & Articles © All Rights Reserved.